That is Paul William Roberts writing in his personal homage to India Empire of the Sun - long out of print but well worth searching out. Mystic Sai Baba, Mother Teresa, George Harrison, a millionaire drug dealer, and the founder of India's first pornographic magazine are among those who appear in the book, which is based on Roberts' residence and travels in India in the 1970s and 1990s. There may be a licensing opportunity lurking here as my research can find no Western release of Shanti-Dhwami - it was first issued in India on a Deccan records cassette in 1985. Paul William Roberts' quote refers to the 1990s, so presumably he was listening via the now forgotten primeval technology of cassette and Walkman. 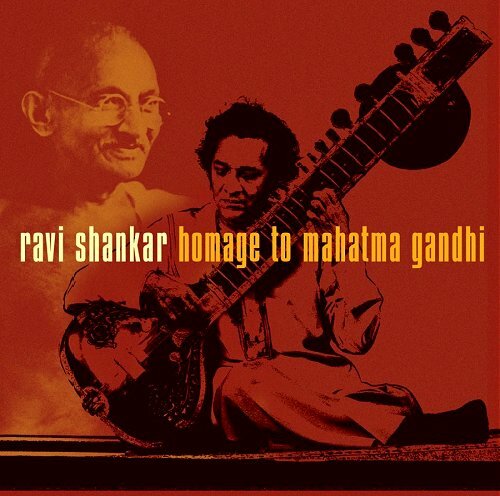 Without a copy of Shanti-Dhwami to hand my soundtrack and header image is another shimmering Shankar masterpiece dedicated to a very different Gandhi. His Raga Mohans Kauns: Homage to Mahatma Gandhi was composed shortly after the assasination of the peace-loving father of the Indian nation in 1948. I think I am right in saying the disc above, which was released in Deutsche Grammophon's Edge Music series in 2004, is its only release in CD format. More transcending musical definition from Ravi Shankar together with George Harrison here.